This week’s BEACON Researchers at Work blog post is by University of Idaho postdoc Martina Ederer. After working on many different projects in a number of different labs, I always seem to come back to the study of evolution. Hence, I was very excited about joining the Wichman lab at the University of Idaho (for the second time) about a year ago. Our research in the lab revolves around genome evolution, that is, how the genetic code or DNA of an organism changes over time and what the consequences of these changes are with respect to the fitness of the organism. We measure fitness in terms of how fast the organism reproduces. We work with is phiX174, a small virus that infects and kills the bacterium E. coli. This small organism is very handy to study evolution because it has a short generation time and is easy to grow in the lab. For example, if we start out with 1,000 viruses and let them grow for 30 min. we end up with 1,000,000 viruses. PhiX174 does not encode all of the tools it needs to replicate, so it uses E. coli to make its DNA and proteins. Some of these new viruses have ‘mistakes’ (mutations) in their DNA because the copying of the DNA is not always 100% accurate. Most of these changes are ‘bad’ for the organism, reducing its fitness and maybe even causing death, but a few of these changes are ‘good’ for the organism and allow it reproduce faster in the given environment than the ancestor, measured as an increase in fitness. Now we can study multiple environments (i.e. increase or decrease temperature, provide a new host, etc.) and determine which mutants are best adapted and have a better fitness than the ancestor. Such mutations rapidly dominate the population. Since we have grown this virus in our lab for many years and have exposed it to many different growth conditions, we have quite a collection of mutants in the lab that are adapted to new growth conditions. For example, we have a number of mutants that can infect a new host, a particular strain of the bacterium Salmonella. These mutants all have three or more changes in their genomes. Now, since these mutants arose ‘naturally’ some of these changes may not be necessary for growth on the novel host, but just hitchhiked along, because they happened to not negatively affect the virus’s fitness. We are interested in finding out which of the changes/mutation allow the virus to grow on the new host and which ones are only coincidental changes that do not have any impact on the fitness of the organism on this host. Novel cassette-assembly system for phiX174. To do this we constructed a ‘cassette system’ that allows us to assemble the genome of the virus from14 different DNA pieces in vitro (in a test tube) and then use it to infect the E. coli host. This allows us to construct viruses with each single mutation as well as all possible combinations for a given pathway. For example, we have isolated a mutant virus from previous experiments that are able to grow on Salmonella as a new host in addition to the old host, E. coli. We identified three changes (A, B, and C) that we think are important for growth on the new host. 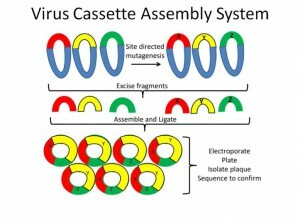 Using this novel cassette system, we constructed viruses with the single mutations X,Y, or Z; the double changes XY, XZ, or YZ; and the triple XYZ. Now we can test the phenotype of each mutant virus, for example how fast, if at all, each one will grow on the new host, and which changes allow the virus to bind to the new host cell. These studies, when interpreted in the ecological context of the initial experiments, may lead to a set of general rules for the evolution of host switching of pathogenic viruses important for human health. Just think of the emergence of diseases caused by HIV, Ebola and SARS, all viruses that switched from its native host to humans. 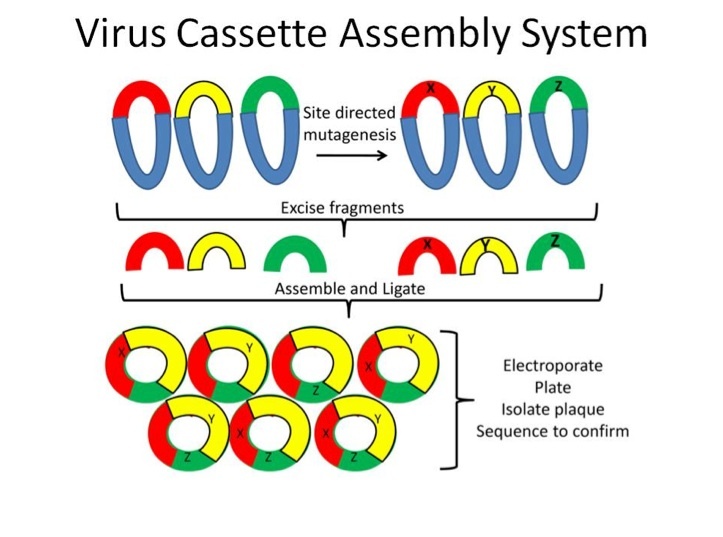 Another, equally exciting application of this cassette virus assembly system is that we can use the system to ‘create’ viruses with a designed genome. Our latest endeavor is the recreation of the ancestral phiX-like virus. When we isolate phiX-like viruses from the environment, we find that they differ from each other at many nucleotides (building blocks). This is what we would expect since, as I mentioned above, the copying of the genome introduces mistakes that can lead to a virus better adapted to a given environment. We looked at a number of different genomes, aligned them to determine the changes that they have accumulated and used a computer program to reconstruct the sequence of the ancestral virus that is a virus that lived in the past and gave rise to the current diversity of phiX-like viruses, but is not part of the current population. Now we are in the process of assembling this ‘dinosaur’ phage and we will study its fitness and various phenotypes. Further, we can evolve it in the lab under different conditions and monitor how its genome changes. Will it evolve to be more like our present day laboratory-adapted phiX174? Take a look at some artistic renditions of this beautiful small organism, phiX174. 1977 Genome (2007). By Holly Wichman, 7” x 7”, Strung Swarovski crystals, Bali silver beads, sterling clasp, sterling spacers, wire. 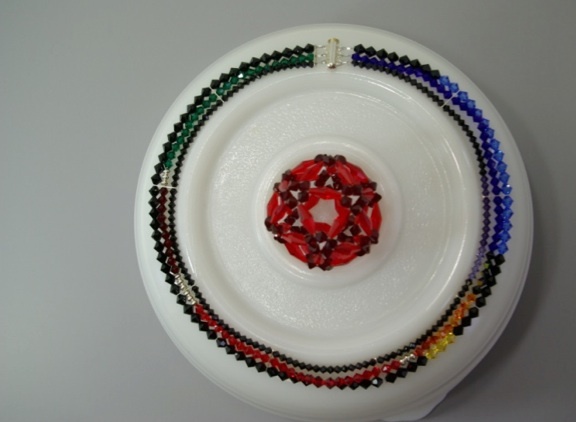 This necklace represents the genome organization of phiX174 – the first genome to be fully sequenced, published in Science in 1977. Each of the eleven genes is shown in a different color; black crystals are spacers. Intergenic regions are in silver. 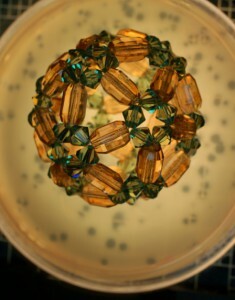 The necklace shows the overlapping reading frames, observed for the first time in this virus. For more information about Martina’s work, you can email her at mederer at uidaho dot edu. This entry was posted in BEACON Researchers at Work and tagged BEACON Researchers at Work, Biological Evolution, E. coli, experimental evolution, Synthetic biology, Viruses. Bookmark the permalink.